'He personified the kind of debonair charm, sublime sensuality and unabashed romance women fantasise about,' says Sukanya Verma. 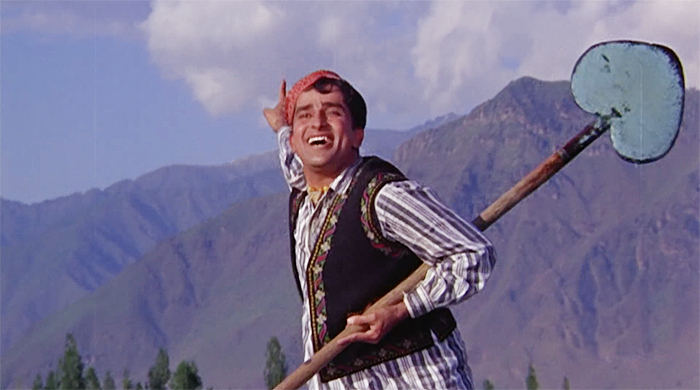 IMAGE: Shashi Kapoor in Sharmilee. 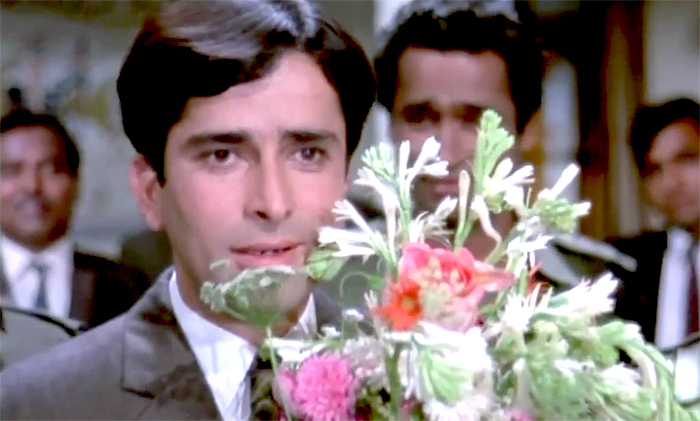 Only last week I wished Aseem Chhabra, my colleague and author of the Shashi Kapoor biography The Householder, The Star on his birthday with a gif of the charming star flashing his famous smile and flooding the frame with flowers. Now as I receive the sad news of Shashi Kapoor's passing, the same marvellous, melting smile appears before me. Undeniably attractive as he was, his crooked smile -- one that made women go weak in the knees -- symbolised the beauty of imperfections to me. When I was a kid, I was terribly conscious of my irregular set of teeth but seeing Shashi Kapoor laugh so wholeheartedly despite it inspired me to embrace my defect as my distinction. Although he graduated to playing supporting parts by the time I woke up to movies, my love for vintage fare ensured I was familiar with his stardom from back in the day. I still remember how my next-door neighbour Chhaya Aunty would transform into a giddy schoolgirl talking about him. And the fact that he responded to her fan mail with a letter turned her into an even bigger fan. Often she would share the gratitude expressing contents of her carefully preserved letter with me. IMAGE: Shashi Kapoor in Jab Jab Phool Khile. Shashi Kapoor was a born star. Two of his earliest performances, playing a knee-high version of big brother Raj Kapoor in Aag and Awara, confirm it most ardently. But it's the imagery of him as the boyish, bashful adult serenading his sweetheart with a lilting song that struck a chord on screen. Personally though, it's his thinly veiled sarcasm in Sharmilee's Kaise kahen hum pyaar ne humko kya kya khel dikhaye that impressed me more. From fluffy musicals woven around the routine rich-poor conflict and maudlin misunderstandings in hits like Jab Jab Phool Khile, Sharmilee, Kanyadaan, Haseena Maan Jayegi, Pyaar Ka Mausam, Pyaar Kiye Jaa, Abhinetri, Waqt and Aa Gale Lag Ja to happily filling in the runners-up slot in Amitabh Bachchan centrepieces like Namak Halal, Do Aur Do Paanch, Deewar, Trishul, Kabhi Kabhie, Shaan, Silsila, Suhaag, Shashi Kapoor's career followed a safe but significant path. 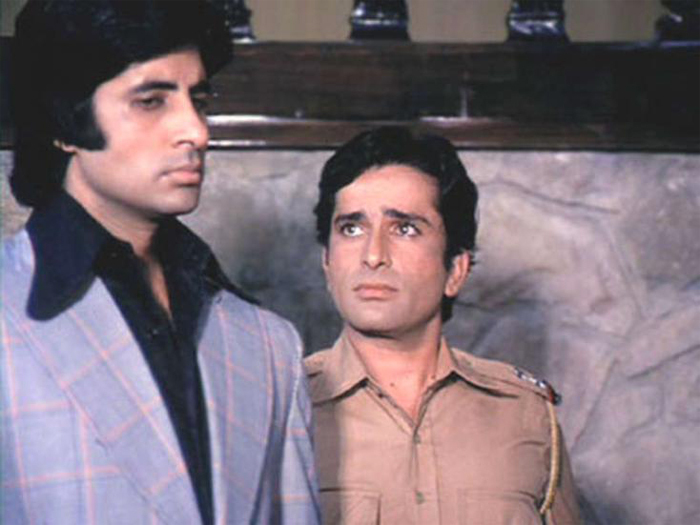 IMAGE: Shashi Kapoor and Amitabh Bachchan in Deewar. Mere Paas Maa Hai -- one of the most immortal words spoken in Indian movie history came out of him. His efforts to cross over internationally in Merchant-Ivory's The Householder, Shakespeare Wallah and Bombay Talkie as well as Conrad Rooks' Siddhartha revealed an aesthetic and sensitivity profoundly missing in his portrayal as a Hindi film hero. He personified the kind of debonair charm, sublime sensuality and unabashed romance women fantasise about. But 1960s Bollywood was an awfully demure decade and few filmmakers could handle forget exploit his ripping sexuality until Satyam Shivam Sundaram and Kabhi Kabhie came along. I didn't care much for Satyam Shivam Sundaram's explicitness or remorse but Shashi Kapoor's insight in Yash Chopra's sophisticated understanding of mature relationships is rather special in its reflection of the evolved, non-judgemental male unconcerned by his wife's romantic past. Known for his deep affection towards his significant other and soulmate Jennifer, Shashi Kapoor's performance comes from a place of truth. IMAGE: Raakhee and Shashi Kapoor in Kabhi Kabhie. Shashi Kapoor came into his own once he turned producer and roped in avant-garde directors like Shyam Benegal, Govind Nihalani, Aparna Sen and Girish Karnad to create for him resulting in masterpieces like Junoon and 36 Chowringee Lane. Saddled with a lover boy image for years, he grabbed the chance to shine in striking avatars in latter years -- Junoon, Kalyug, Vijeta, Utsav, New Delhi Times, In Custody with heartbreaking melancholy and lasting intensity. His commitment to grotesqueness and radical transformation in Utsav was particularly effective. Odd as it may sound, I even relished his directorial debut in the flop Indo-Russian fantasy, Ajooba for its quirk, audacity and ambition. 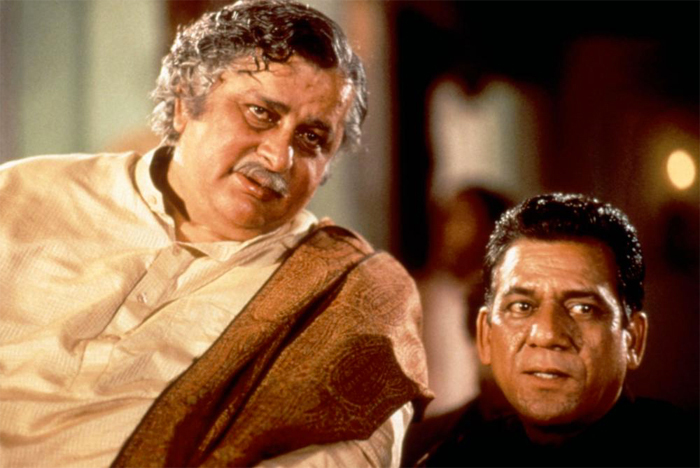 IMAGE: Shashi Kapoor and Om Puri in In Custody. One of the most handsome, pleasant personalities to grace celluloid, the only time I was sad to see Shashi Kapoor was when I saw him in real life. It was at Prithvi theatre, a haven for theatre he created so lovingly with his wife, where Shabana Azmi and Javed Akhtar were performing Kaifi Aur Main. He sat on a wheelchair, solemn-faced, still as stone, as if oblivious to all the activity and awe around him. I saw him again, inside the elevator at the Kokilaben Ambani hospital, where I was attending to my ailing mom and he was visiting for presumably a check-up. I was extremely stressed out those days. And perhaps he could see it too. We looked at one another. He smiled at me as though saying he understands. His crooked teeth weren't visible. I smiled back and showed him mine.